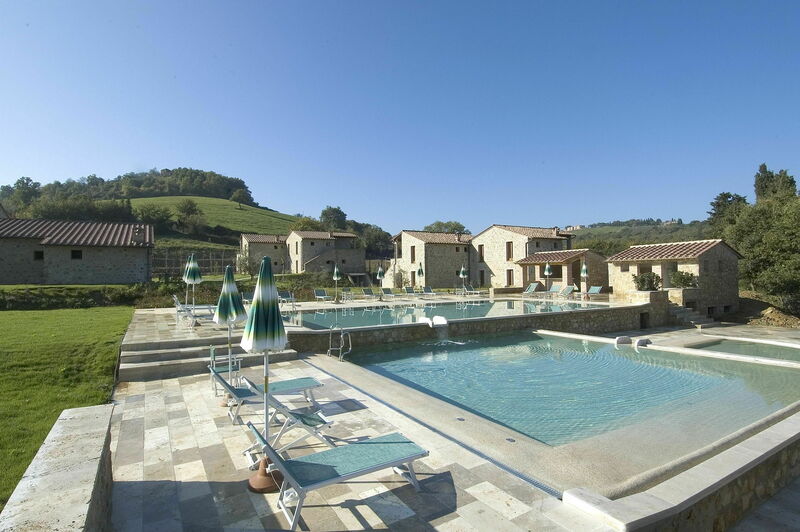 Accommodation in charming Siena, nice complex recently built situated in quiet location amidst rolling hills, close to the medieval small town of Casole D’Elsa and close to an ancient water spring. The property comprises 3 independent villas offering 15 spacious and comfortable accommodations with stone walls, brick pavements, rafter ceilings, all of which tastefully furnished. Distances: Casole D’Elsa with all kinds of shops 2 km, Colle Val D’Elsa approx. 10 km, charming Siena approx. 30 km, Florence 55 km. At guests’ disposal: large furnished garden, shared barbecue, beautiful salt water swimming-pool with small waterfalls (16 x 9 m – maximum depth 1,4 m – open from 01/05 to 30/09), salt water swimming-pool with Jacuzzi (9 x 8 m – maximum depth 1,3 m – open from 01/05 to 30/09) salt water swimming-pool for children (25 m2 – maximum depth 50 cm – open from 01/05 to 30/09). On the premises there is a small restaurant where guests can taste nice local recipes and have the possibility to have breakfast, lunch and dinner. The access to the property and accommodations is via an unpaved but well-maintained road. Parking within the grounds. Extra services: shared laundry (to be paid on the spot). Baby bed available by request at € 25,-/ per week(payment on the spot). Maid service available by arrangement (to be paid locally). All of the apartments are provided with air-conditioning (payable on the spot depending on the use). Bikes for rent free of charge. The use of the sofa-beds (included in the rental price) is suitable for children up to 12 years old. 45 m2. Ground floor or 1st floor: living-room (sat. TV) with double sofa-bed (suitable for children up to 12 years old), kitchen corner and dining area, bathroom with shower, double bedroom with ensuite bathroom with shower. Garden and independent entrance. Additional costs paid on site: Security deposit: € 200,-Final cleaning: € 60,-Heating and air conditioning: € 80,- / per weekThe use of the sofa-bed (included in the rental price) is suitable for children up to 12 years old.